Dog bite or child abuse in Florida? An case involving aggravated child abuse by the father of a two-month-old infant came before jury in Gainesville Florida in February 2010. The defendant was a 39-year-old Gainesville police officer who blamed his daughter’s injuries on the family dog, an adult, neutered Dutch Shepherd named Bandit. The matter proceeded to trial approximately 3 years after the incident. 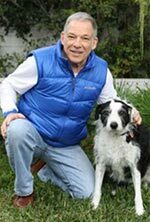 Dog bite law varies from state to state. Basically, dog bite law in this country is dichotomized into law which makes an owner strictly liable for injuries caused by a dog bite regardless of the owner’s prior knowledge, and into law which makes an owner liable only if they had knowlewdge of the dog’s dangerous nature (e.g. common law theory). In addition, in every state, recovery for person injury can also be made on the basis of negligence theory. According to the statements given by the defendant and his wife , Bandit was nonaggressive by nature, and always accepting of the infant. They describe the dog as protective of the infant noting that Bandit would rest near the infant and he would lick the infant with affection. According to the defendant and his wife, the dog never showed any behavior suggesting that he was jealous of the infant or possibly could be aggressive towards the incident. On the day the incident, the officer had returned from a night shift, and sometime later his wife left for work, and he went back to sleep in the late morning, with instruction from his wife to mind the baby if needed. Approximately 30 minutes after the wife had left, she received a phone call from her husband saying that the dog had attacked the child. When the wife left home, her husband was in the bedroom sleeping and the dog was sleeping on the couch in the living room with the baby nearby in a commercial baby seat. The infant was taken to the hospital emergency row in critical condition with broken ribs, a ruptured spleen and a lacerated liver. 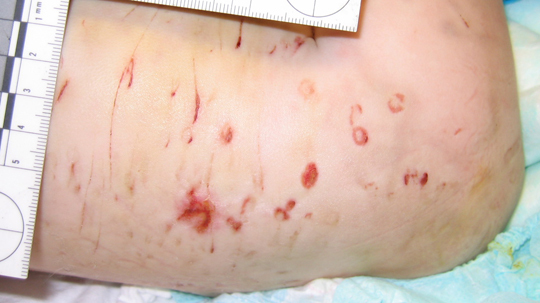 Significantly, there were no puncturewounds on the infant, but there were a number of unusual non-penetrating, small circular marks on the infant’s torso, which may have caused a small amount of external bleeding. In addition, there were a series of patterned scratch marks across the infant’s torso. These were the only external injuries on the child that could have possibly come from the actions of a dog. There was a near complete absence absence of injuries to the head and neck area, parts of the body that are disproportionally attacked by a dog in an aggressive state. A forensic dental expert examined the external injuries and concluded that the injuries were consistent with marks that may have come from the claws of a dog and the dog’s teeth. However, significant attention by the defense was paid to the fact that that the dog’s canine teeth were either worn to the point where the tip of the teeth were essentially flat surfaces. 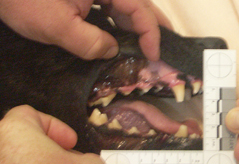 Photographs of the dog’s teeth, and of the injuries inflicted to the victim’s torso, appear below. Prosecution accepted this but did not believe these injuries were voluntarily inflicted by the dog. Instead, they felt the defendant himself manipulated the dog to make these marks on the infant to cover up his own aggressive actions towards the infant. In particular, prosecution noted that that if the dog had chosen to bite their certainly would have been puncture wounds, typically to the head area. Moreover, the scratch marks on the infant’s body were not the typical kind of scratch marks made by a dog. Moreover, the prosecution did not understand how a dog that was non-aggressive by nature would suddenly turn and attack a child whom it had gotten on well with previously. The prosecution’s case was based entirely on circumstantial evidence, and in this regard they called many medical experts as well as in animal behavior specialist. Medical experts opined that injuries to the spleen, kidney and crack ribs were undoubtably symptomatic of injuries that could have been inflicted only by the father through by a squeezing motion. From an animal behavior perspective, there were numerous reasons why this dog would not attack the child under the given circumstances, some of which included the temperament of the dog, the context in which the injury occurred, and the fact that the wounds were not consistent with dog bite injuries both in terms of where the injuries were found on the child and because of the lack of puncture wounds which should have easily been inflicted by a dog this size if it was truly an aggressive state at the time of the incident, or for that matter in a playful motivational state. As stated above, the prosecution believed that the father intentionally manipulated the dog’s mouth and claws to make it look like the child was bitten and scratched by the dog. The defense contended that the humming noise from the commercial baby seat could have induced the attack along with its motion, that dogs in general may attack out of character, that the dog may have been trying to establish dominance over the infant , and that in some dog attacks injuries to the head and neck area did not always happen. Earlier the defense argued that the may have been having a bad dream dog, therefore prompting it to attack. Finally, the defense argued that inconsistencies amongst the prosecution’s expert’s were sufficient to place doubt on the prosecution’s theory of how the incident happened. The jury returned a verdict of not guilty, after four hours of deliberation. The rationale for this verdict is unclear, although prosecution felt that the problem thay may have had with the case was that there was no direct evidence, and the teeth of a dog were blunt, thus making the external injuries on the infant somewhat consistent with the kind of injury a dog with this kind of teeth would inflict. Nevertheless, it is hard to reconcile how a dog could inflict no serious external injury (such as lacerations or more severe punctures), but yet cause such extensive internal injury. The dog’s mouth could have been easily manipulated to cause the external injuries shown in the photos above. Accurate reconstruction of dog attacks can be done circumstantially based on what is known about the dog, the context in which the incident happened, and the nature of the injuries, etc., as was readily done in this case, but even if this information is combined with credible medical evidence and presented to a jury in convincing fashion, cases like this which lack direct evidence may be difficult to successfully prosecute.